Two British police officers who tried to recruit student activists to spy on their campaigning peers are under investigation for alleged misconduct. The internal probe by Cambridgeshire Police follows allegations that officers repeatedly approached students in a coercive manner, eventually causing them to them to give up their campaigning. 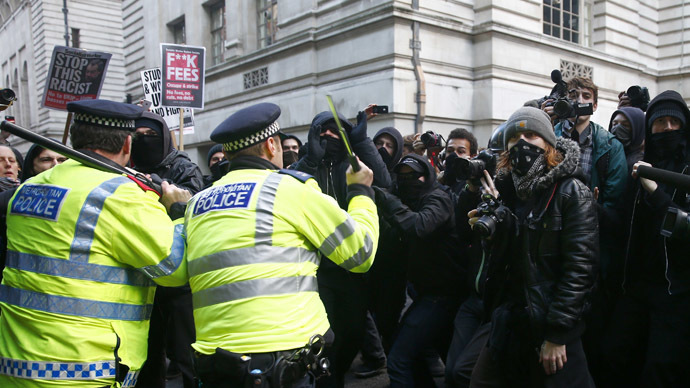 Undercover video footage emerged in 2013 showing a police officer attempting to persuade an activist to spy on students campaigning against austerity, racism and environmental destruction. Students report they felt stressed and paranoid after the encounters, with some giving up their political activities. A UN special rapporteur on the freedom of peaceful assembly suggested the Cambridge cases may be the tip of the iceberg in the UK. One campaigner was allegedly offered cash in exchange for spying on fellow students at Cambridge University. He reportedly became paranoid following the incident and stopped activism altogether. A 23-year-old single mother alleged police threatened to prosecute her if she told anyone about their attempt to recruit her as a mole. She told the Guardian she stopped anti-racism campaigning and was left “feeling violated, isolated, vulnerable and paranoid” by the affair. She also feared criminal prosecution would impact on her university studies, future work prospects and her young son. One campaigner wore a hidden camera when police attempted to persuade him to spy on activists. The officer goes on to say he wants the names of students going to demonstrations and details of the vehicles in which they travel to protests. He also asked the activist to use Facebook to research upcoming protests. When the campaigner asked whether an anti-tuition fees group known as Cambridge Defend Education would be of interest to police, the officer said ‘yes’. “That's the sort of thing that we would be looking for. Again, basic sort of stuff. It's all the internet. When they have meetings and they are discussing what they are going to do, that's when we'll say ‘Will you go along?’” he said. Cambridgeshire Police are carrying out an internal investigation into the allegations. The force has given one officer formal notice, while the second officer no longer works for the force. “An investigation is currently being carried out following a public complaint, therefore it would be inappropriate for us to comment any further on this matter,” Cambridgeshire Police said. Kiai published a report critical of UK police surveillance of political groups in 2013 and has continued to monitor the Cambridgeshire allegations. The surveillance of protestors is “raw, unvarnished intimidation and activist-busting,” he said.